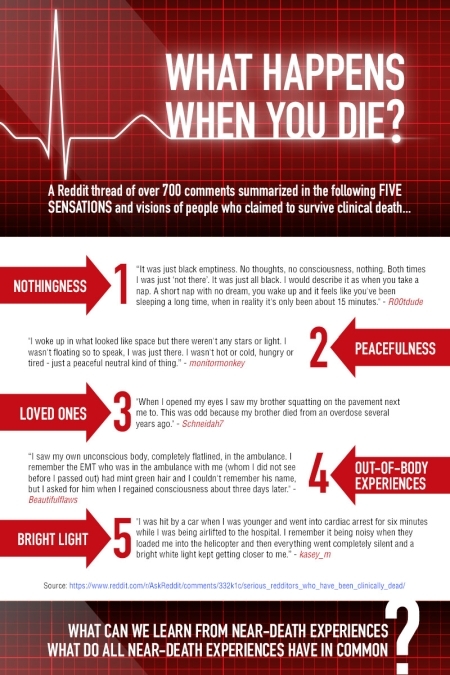 People who have survived clinical death have described a number of different experiences, among them being sensations of nothingness, peacefulness, seeing loved ones, out-of-body experiences where they see what’s going on around them, and either entering or heading toward a bright light. According to the wisdom of Kabbalah, such experiences are psychological and don’t point out what really happens after we die. Near-death experiences do have a commonality that we can learn from, which is that we experience a certain sensation of freedom from our corporeal-material body. However, such freedom is temporary and limited compared to the sensation of freedom we can attain by freeing ourselves from the control of our egoistic desires that hold tightly onto us our entire lives. Kabbalah considers the latter true freedom, and that it is synonymous with the attainment of the soul. In other words, the soul is not something we are simply given upon our death, or even in our lives without any effort on our behalf. It is a new desire that we can develop and grow during our lives, with the help of the method of Kabbalah, where we discover our freedom from the hold of our egoistic desires. We have created a page dedicated to answering common questions about what happens when we die: Do we enter an afterlife? Do we reincarnate? Do we merge with pure consciousness, or nothingness? What are near-death experiences and clinical death? Also, what is a soul, and how do we attain a soul? Follow the link in the above image in order to delve deeper into this topic.